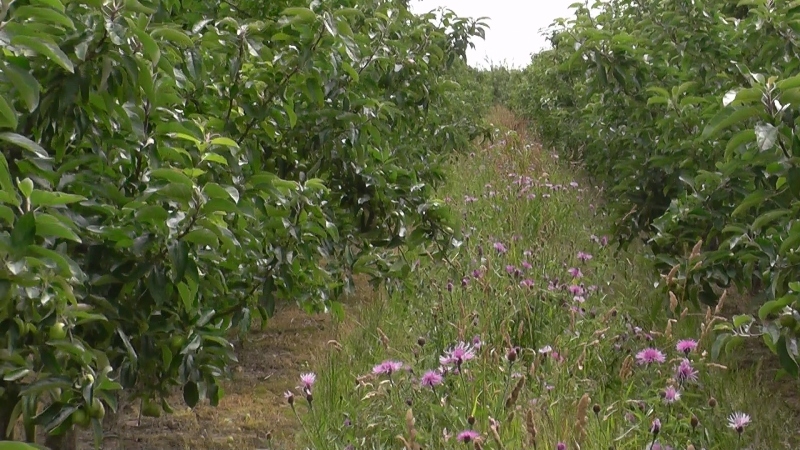 On Tuesday afternoon an event delivering the latest research from NIAB-EMR, University of Worcester and collaborators on	managing the orchard	environment for	quality fruit production took place at Chandler & Dunn's Lower Goldstone farm in East Kent. 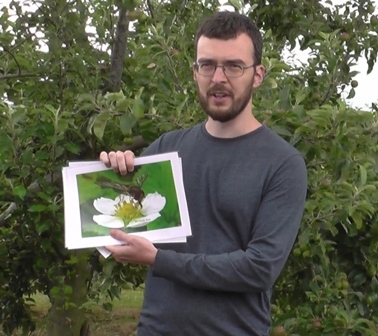 The afternoon included an orchard walk looking at the advantages of wildflowers in an apple orchard; discussion with principal speakers on pollination, insect friendly practices and the beneficial management of precious predators. 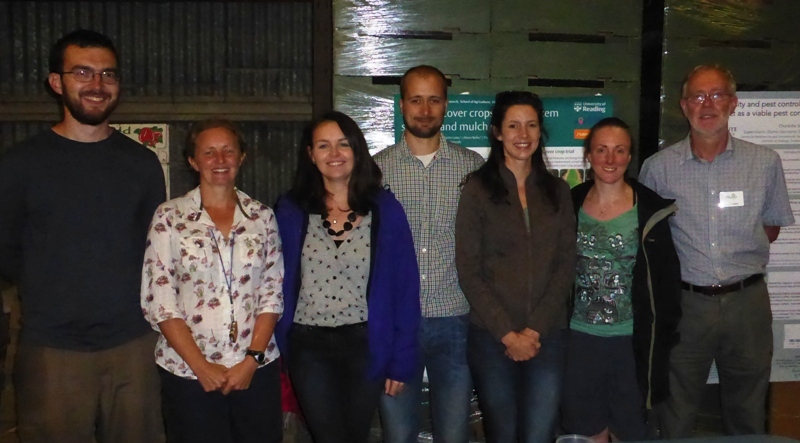 After the orchard walk, those attending returned to a barn for a 'poster session' with displays of pollinating insects, information about wildflower management and talks by three PHD students on their specific research projects. The opening comments were made by Paul Cobb representing the Campaign For the farmed Environment - the CFE helps farmers support the natural environment, whilst farming productively. 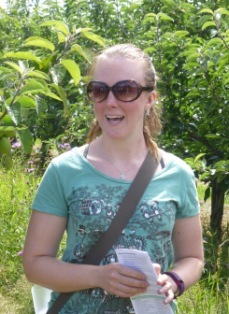 Megan McKerchar (University of Worcester) - presented her updates on "Managing wildflower strips in orchards at Chandler and Dunn - including the benefits to pollinators and beneficial insects and the environmental and economic value. 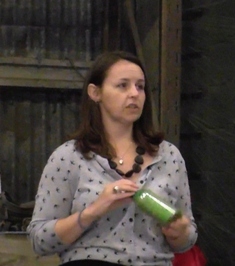 Megan 'kicked off' the presentations as she has been carrying out her trials over the last 3 years at Lower Goldstone Farm. Rachel McDonald (Centre for Agri-Environment Research, School of Agriculture, University of Reading) - Earwig numbers in orchards in relation to semi-natural/natural habitat features. Megan took us to the Wildflower trial site and explained the principles of planting wildflowers on the orchard and her experiences with the project to date. Accompanying the group; Clive Chandler who manages the fruit unit at Lower Goldstone. Megan explained the importance of designing the wildflower mix to ensure they are not flowering at the same time as the apples. The 'flower mix' species recommended for sowing in orchards was; Yarrow, Knapweed, Oxeye daisy, Birdsfoot trefoil, Selfheal. Red campion and Red clover. The operating plan: 'sow' every other row of the orchard - ideally in Autumn, but alternatively in Spring with the recommended mix. Sowing alternative rows allows a mixed management approach of the alleyways, where the 'non' wildflower strips can be pulverised, while the wildflower alleyways give the maximum floral cover. Megan said using wild flower type seeds; although more expensive, can last up to ten years where well managed, while 'agricultural types typically only persist for 4 years. Asked about preparation; Megan said the were sprayed with Glyphosphate and after 10 days lightly cultivated - circa 60% disturbance to create a seedbed; 'sow the seed' ideally before rain is due. If no rain is forecast, roll the strips to form a contact between the seeds and soil. Megan also advised using half a bag of sand with the seed to optimise the spreading technique and deliver better cover. 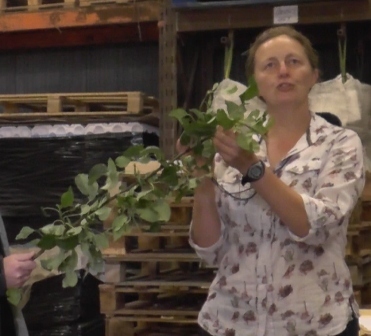 Turning to attracting beneficial insects......discussing natural enemies, the level of 'Rosy apple Aphid' in the trees was less in the wildflower trial areas, the same number of trees were infected, but the level of infestation lower. 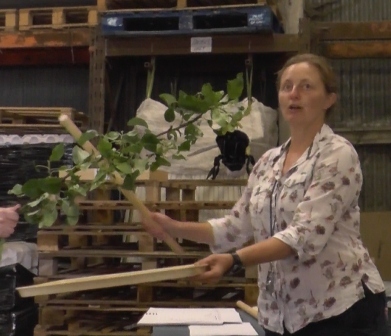 Megan believes the 'Rosy' is facilitated by ants and with less ant activity in the tree, presumably due to the ants being 'happy' in the wildflower strips, the RAA is less likely to increase in the tree canopy. Within the trial areas, there were more cone footed spiders, earwigs and anthocorids. Reflecting on the comparative overall yields from wildflower trial area v control areas, no discernable increase in yield found; Megan believes it may need more of a build up in pollinators before we see an increase in yield. Dylan discussed the importance of hoverflies as predators and pollinators in crops - the efficacy and encouraging pollinators into crops. He looked at the pollination and aphid control abilities of pollinating insects. 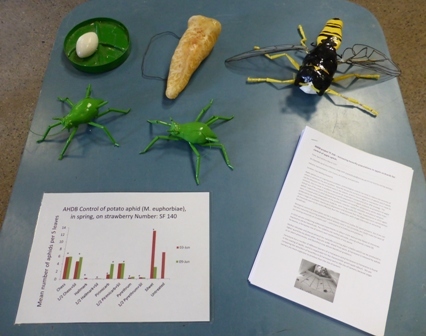 Using Strawberries as his example, Dylan demonstrated the 'operational areas' of typical pollinators; namely Bumble Bees, Honey Bees, Hover Flies and Solitary Bees. A Strawberry has '200-300 female parts' and delivering optimum pollination is 'not that simple' without adequate pollinators. The Bumble Bee operates on the 'centre' of the flower (its buzz may also bring about a benefit from vibration) - the Honey Bee operates in a similar way; the Hover Fly operates in various areas of the flower and the Solitary Bee operates around the edge of the flower receptacles. Dylan estimates some 500 tonnes of UK strawberries are lost to aphid damage annually. This amounts to £2 million of lost fruit. The primary candidate is the Melon Cotton Aphid which is resistant to some chemicals or at risk from the withdrawl of effective aphicides. By far the most voracious aphid predator on strawberries is the 'Hover Fly' - one larvae can devours 660-1,140 aphids in a lifetime, while 'Lacewings' can 'rack up' 560-790 aphids in a lifetime. These voracious aphid predators are equally efficient in other crops; Wheat, Brussel Sprouts and Lettuce among them. Dylan said he has been experimenting with 'wildlife pods' in table top strawberries, by placing a 'pod' at regular intervals in the supporting gutter between potted strawberries in Kent. Hoverflies are more numerous where wildflowers are present. In the future Dylan said 'Synthetic volatiles may be the answer to attracting the desired predators. Paul said, whatever the size or type of your farm, wildflowers are beneficial. "Do look at the value of 'greening' - think about bringing in beneficial flowers, do not just leave it to 'self develop' - remember 'hedges play a vital part in supplying food for pollinators; particularly in the early part of the season. Think about how we manage these areas. Bumble Bees need places to breed.....the early season is known as 'the hungry gap' a period where Bumble bees are founding their nests; Paul identified three complementary approaches. 1) Planting early flowering trees; Goat Willow (Salix caprea) and Grey Willow (Salix cinerea) provide some of the most important early season resources, other important species include; Blackthorn, Hawthorn, Cherry plum, Maple and Crab apple. 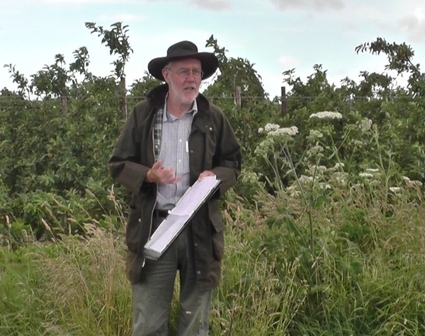 Paul said ensuring the best mix of trees on the farm can be as simple as planting the right species in hedgerow gaps, without taking land out of production. 2) Encouraging naturally occurring early wildflowers - these early flowering wildflowers can often be found at the bases of hedgerows or on edges of ditches and tracks. 3) Sow a specially designed wildflower seed mix. Michelle had planned to do her presentation out in the orchards, but as the rain fell on Paul Cobb during his presentation, we all decided it would be better to 'make a run' for the barn; a wise decision! 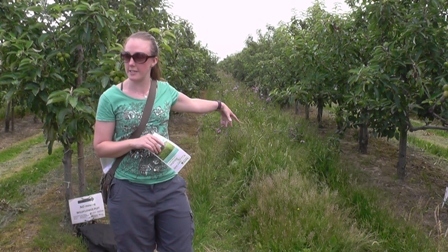 Michelle highlighted the AHDB - LINK project into combatting 'Pear sucker' (Cacopsylla pyricola) which has been running for 5-6 years. This pest is the most challenging faced by pear growers and with pesticides becoming more ineffective, the search for a more effective 'environmentally friendly way' has become the 'holy grail. Michelle recounted the experience of David Long whose family have been growing pears in North Kent for many years. 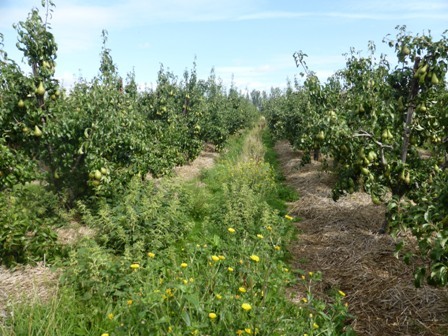 The farm is always very productive and grows some of the best yields of pears in the UK, however as pear sucker gained hold on his trees, and having tried all the pesticides available, found the pear suckers developing resistance to most chemicals. 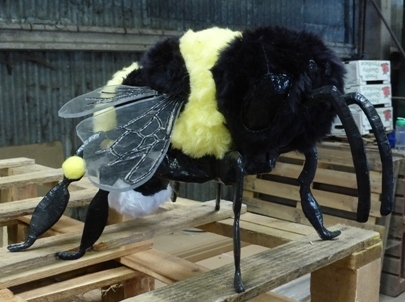 So David went out at night with 'headlamps blazing' to spot the insect life in his orchards; the result; very little because the predators had fallen foul of the pesticides and this spurred him to seek another option. 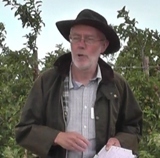 Aware of the AHDB - LINK project - David set about introducing Anthocorids for their predatorial skills with pear sucker. Anthocorids favour nettles as a host plant and by increasing the presence of nettles, the Anthocorids had a safe haven when not required as pear sucker predators. David set up a weekly monitoring of his pear trees to establish the level of Pear Suckers and Anthocorids. Assessments should start at the 'mouse ear' stage. Each Monday morning one of his farm staff goes straight to the orchards (no distractions allowed) and carries out her monitoring. The Monday morning 'process' takes one member of staff 3 hours; using a Protocol which identifies 3 orchards with High, Medium and Low sucker infestations. 30 trees are checked in each orchard using a W-Shape profile across each orchard. Assessments should start at the 'mouse ear' stage. The data is then taken to the farm office where David can interpret and act upon the latest results. The 'predator friendly system' has become so successful that nettles have been dug up (where they are plentiful) and replanted in new orchards to increase the 'friendly habitat' for Anthocorids. After the main presentations, three short presentations by PHD Students followed. 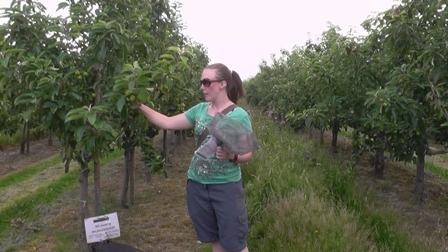 Rachel has been assessing whether the landscape around a farm can influence the levels of pollinating insects in apple orchards. The answers are not always clear, but the surrounding areas can vary with different habitats; earwig numbers on farms were influenced by the complexity of habitats beyond the farms - where apples had been planted near natural habitats (like woodland) there were higher levels of earwigs in the orchards. Earwigs are clearly beneficial as predators in apple orchards; Rachel identified using plastic bottles with corrugated paper inside as 'protective' shelters for earwigs. 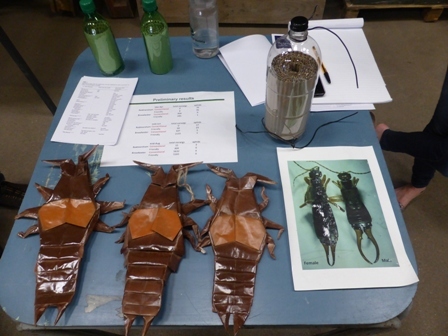 She said this proved useful in her research, but could be a beneficial means of enhancing control of pests by ensuring sufficient earwig population numbers. Rachel emphasised her research (and others) confirms earwigs as valuable pest control agents. Answering a question, Rachel suggested one 'plastic earwig hotel' should be affixed to the trunk of each tree. 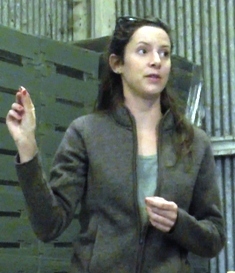 Charlotte has been measuring avian predation rates on artificial caterpillars in orchards under differing management techniques. Initially Charlotte favoured using nest boxes, but discounted that method. Instead she made small 'plasticine caterpillars' to identify 'visits' by birds using the pecks as evidence. Charlotte used green and cream coloured 'target caterpillars' and found other visitors 'identifying marks' particularly earwigs. She also used a camera 'set up' to try and identify which bird species visited the targets. But the speed of the birds 'in and out' maneuver was to quick for the camera; however (she laughed) when she got the camera home, it was crawling with earwigs! Sean has been assessing Alleyway cover cropping and mulching. He agrees with the planting of wildflowers in the alleyways in orchards. 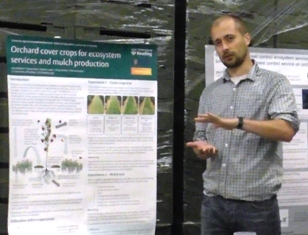 Sean has been looking at the abundance of beneficial species assisting pollination and the influence on pest control. Sean has also been looking at the 'drawing down' of nutrients via the mulch. Using a side delivery mower the mulchings are passed onto the mulch beneath the trees; "in the States (USA) they call it 'mow and blow' said Sean - the mulch is good for avoiding evaporation, suppressing weeds and for improving soil biology. By maximising the soil biology allows fungi to decompose leaf litter and earthworms burying it you have less scab ascospores in the environment for the next year. This technique has been used successfully in Vineyards to decompose litter and reduce disease potential for the following year.